The CSUN AT Conference is attended by thousands each year. Photo courtesy of the Center on Disabilities. 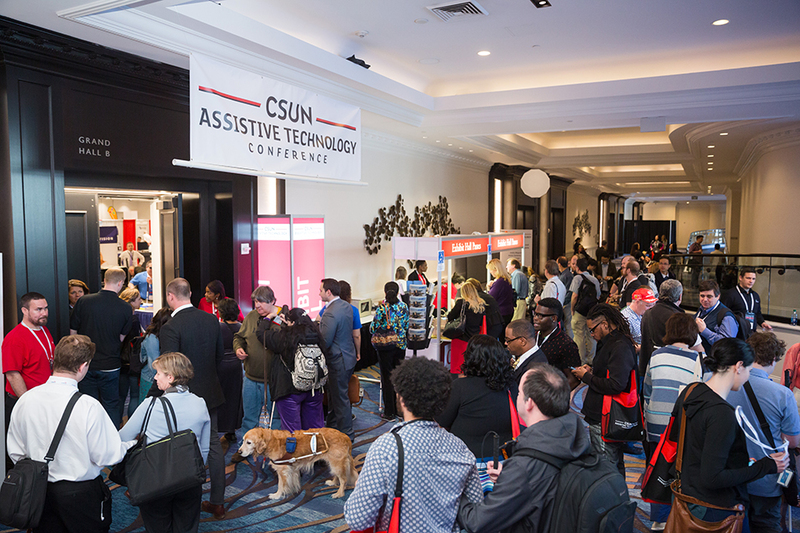 To promote an inclusive society, California State University, Northridge continues to throw the spotlight on the role of assistive technology – which is assistive software or equipment for people with disabilities – at the world’s largest conference of its type this spring, at its new location in Anaheim, Calif.
What is known to the industry as the “CSUN Conference” and hosted by CSUN’s Center on Disabilities (COD), the 34th annual Assistive Technology Conference is expected to attract thousands of people to the event on March 11 to 15 at the Anaheim Marriott. The conference will feature pre-conference workshops, hundreds of educational sessions – including presentations that will be published in the center’s seventh annual “Technology and Persons with Disabilities Journal” – and an exhibit hall with more than 120 booths showcasing the role assistive technology (AT) plays in the lives of people with disabilities. With close to 5,000 attendees in previous years, the conference is expected to continue the momentum for this year’s event. Registration for the conference ends on March 5, and there will be no on-site registration. Exhibit hall-only registration may be completed in advance or at the exhibit hall. On Wednesday, March 13, more than 300 educational sessions will begin, and the exhibit hall will open at 12 p.m. The exhibit hall is free and open to the public through Friday, March 15, at 5:30 p.m. This year’s keynote address will be delivered by Johanna Lucht, the first deaf engineer at NASA to take an active role in the control room during a crewed test flight. Born deaf to a hearing family in Germany, it was discovered that she was deaf when she was three years old. Lucht learned American Sign Language when she was nine. Along with sharing her own personal experiences, Lucht will address society’s definition of assistive technology and challenge some of the existing misconceptions that are currently in place about AT methodologies. The CSUN Conference also will recognize Sean Keegan as this year’s Strache Leadership Award recipient. Keegan is the director of the California Community Colleges (CCC) Accessibility Center, a grant project funded from the CCC’s Chancellor’s office. Keegan’s efforts and the work of the center reflect the award’s criteria for demonstrating an emphasis on AT and its impact on students with disabilities. The Strache Leadership Award and the Dr. Arthur I. Karshmer Award for Assistive Technology Research, which honors the best journal submission, will be presented at the keynote address on Tuesday, March 12, at 5:30 p.m.
For general information about the Center on Disabilities or ATACP visit CSUN’s Center on Disabilities website at http://www.csun.edu/cod or call the center at (818) 677-2578 V/TTY. Please visit the conference website at www.CSUNconference.org for all conference-related information. California State University, Northridge has a long history of involvement in many aspects of assisting persons with disabilities dating back to 1961, when the university was known as San Fernando Valley State College. This precedes Section 504 of the Rehabilitation Act of 1973 and the Americans with Disabilities Act of 1990. In 1983, university officials created the Center on Disabilities to directly assist students in realizing their academic and career goals. To that end, the technology and persons with disabilities conference was launched. California State University, Northridge is a regionally focused, nationally recognized university serving nearly 39,000 full- and part-time students in the San Fernando Valley and surrounding areas. Founded in 1958, CSUN is among the largest universities in the nation and is ranked among the top universities for bachelor’s degrees awarded to minority students. It has nine colleges and more than 2,000 faculty members who teach courses leading to bachelor’s degrees in 69 disciplines, master’s degrees in 58 fields and doctorates in education and physical therapy, as well as 28 teaching credential programs. Continuously evolving and changing to meet the needs of California and the nation at large, the university is home to dozens of acclaimed programs where students gain valuable hands-on experience working alongside faculty and industry professionals, whether in the sciences, health care and engineering or education, political science, the arts and the social sciences.